The progression angle is the angle to foot makes with the ground at initial contact of gait to loading response, and it is often carried through the gait cycle to toe off (see left image above). It is something we often look at to see how a patient may be compensating. It often represents how forces are traveling through the foot (see right image above). 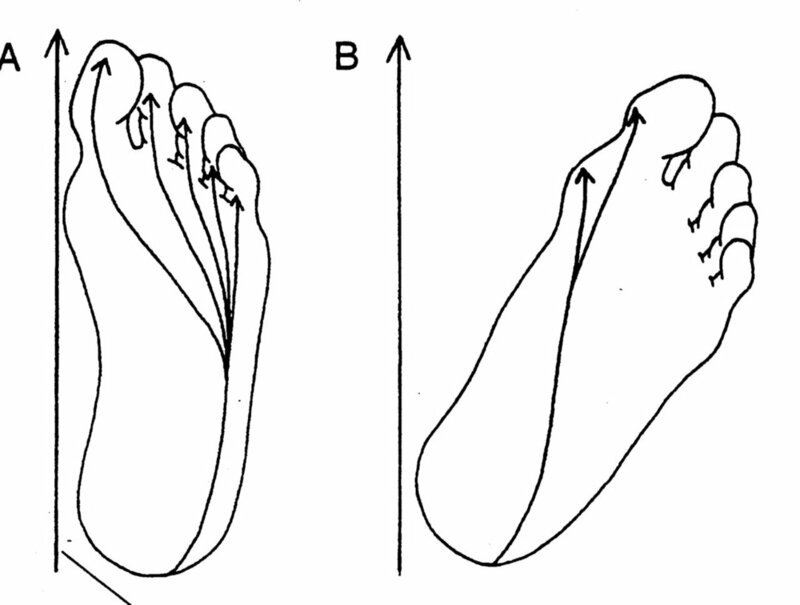 The normal line of force through the foot during a gait cycle should begin at the lateral aspect of the heel, travel up the lateral column of the foot, across the metatarsal heads from the 5th to the 1st, and then through the hallux (see L part of right picture above. The progression angle is determined by many factors, both anatomical and functional, and is often a blend of the 2. Next time we begin breaking this down into bite sized chunks to aid digestion.